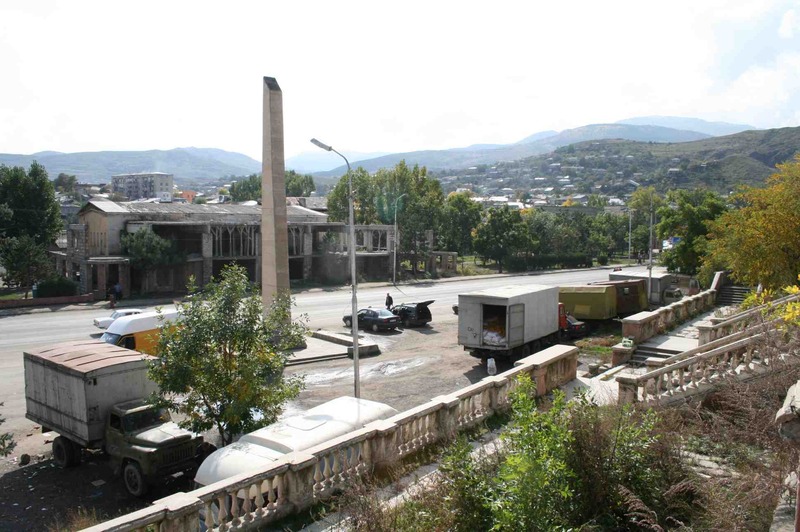 The bus station in Akhaltsikhe. 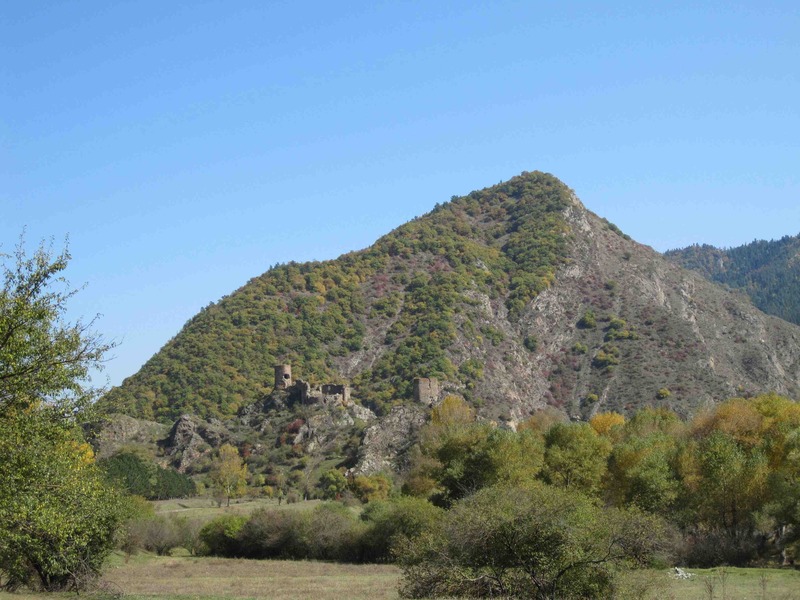 Last Wednesday Khatuna and I took the nine o’clock marshrutka to Akhatsikhe in the southern region of Samtskhe-Javakheti for a brief visit, mainly to check out Vardzia and a few other places I’d wanted to see. I’d been here once before, on a visa run early in the year (taking another marshrutka to Vale and then a taxi to the Turkish border; now the Georgian government has changed the regulations, and certain visitors—including those from the EU–can remain in the country for 360 days on a single entry visa), but only had time to have a quick look around. We arrived early in the afternoon, and got a taxi to our hotel, the Hotel Rio. 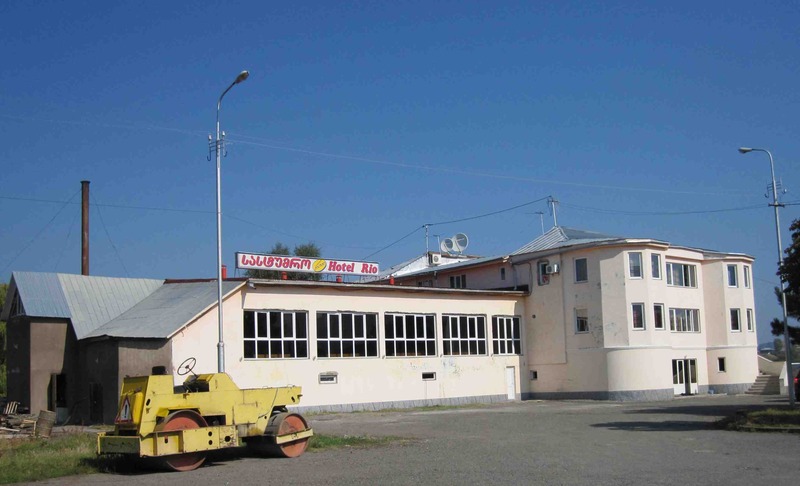 On the web it’s advertised as a relatively cheap but well-run place a kilometer or so from the center of town—with a swimming pool! I had Khatuna call them to see if they had vacancies and whether the pool were in working order, and we were assured that it was. Naturally, when we got to the hotel, we were told that it was not in fact operational; I mentioned that last night someone had told us it was, to which the concierge replied that they had had to suddenly drain the pool that morning… Well well, that’s life. Akhaltsikhe from a hillside nearby, on the way to Sapara. The center of town is a tolerably pleasant place, a central plaza formed by the forking of a street into the two main thoroughfares through the town. In the middle of the triangular space lies a gleaming new church dedicated to the Virgin Mary, with a statue or two of a Georgian sort of alter-ego of Mary, St. Nino. 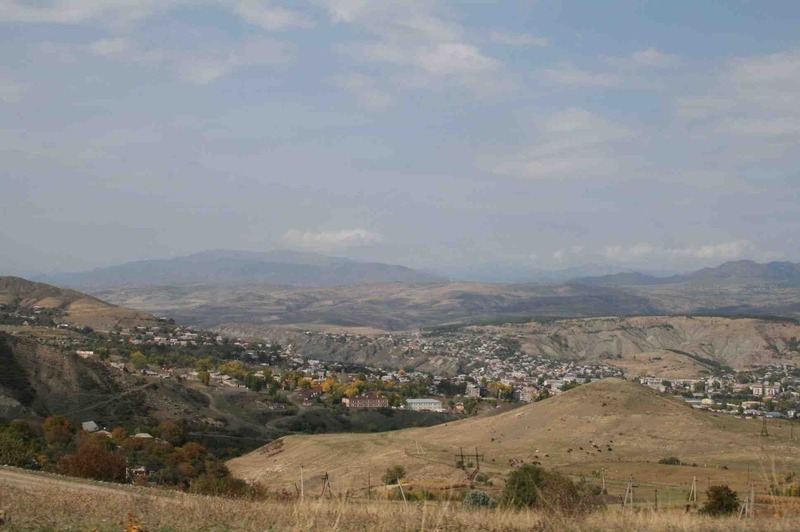 People have a noticeably more Middle-Eastern appearance here—Akhaltsikhe has a large Armenian population—and in fact about half the people were speaking Armenian, with usually the children speaking Georgian to one another. Not a great deal in the way of food to be had: a number of cafe-fronts on the main streets had the appearance of having been closed for years, and we didn’t really see any restaurants. We stopped at a cellar beisl of sorts, rather dark and and with that musty, sticky atmosphere of stale beer, old cigarette smoke, and oily fried food. But the family running the place were friendly and bustled about to make us comfortable. 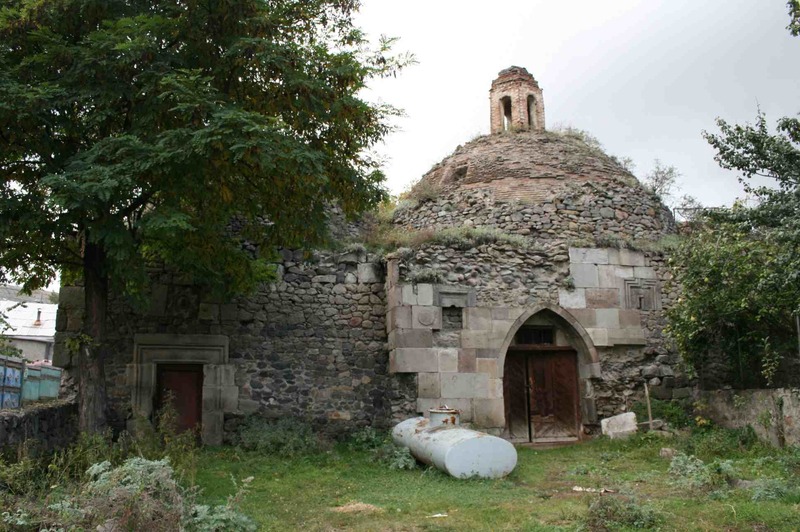 Part of the castle in Akhaltsikhe. After our late lunch we walked around town, heading towards the Rabati, or old town, where most of the sights of interest are to be found. For some reason, a large banner over the entrance to the old town is emblazoned with the slogan “A Symbol of Tolerance”, and we couldn’t figure out why the Rabati was advertising itself as such; it had changed hands several times—first Georgian, then Persian, the Georgian again, then Turkish, possibly Armenian at some point, and then finally Georgian again, but this doesn’t in itself explain the reference to tolerance. It is interesting, in any case, to see a large castle perched on top of a hill overlooking the valley below that wouldn’t look out of place anywhere in Europe, but with the to me incongruous oriental touch of a mosque rising out of it, flanked by a rather stubby minaret. Inside the castle, in front of the mosque. 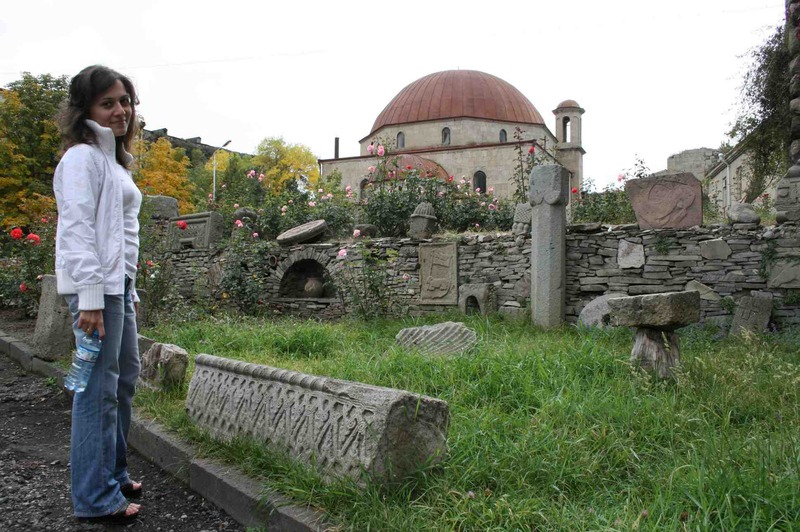 The mosque is now part of the museum and houses a collection of old fragments of local buildings, most of them with inscriptions in ancient Georgian lettering. 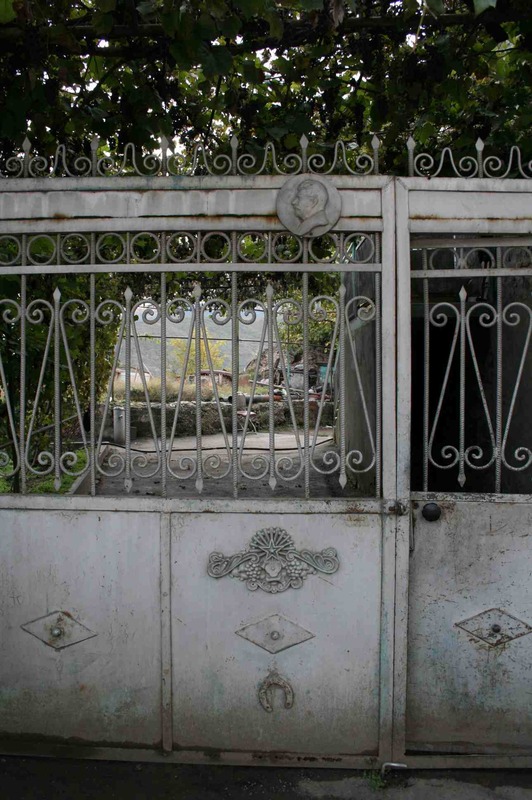 Scattered around the grounds are other blocks and sculptures and friezes and reliefs, relics of a more vibrant time. Behind the mosque is a madrass which I seem to remember hearing or reading was later used as a stable. But I might have imagined it. On a rising crag of stone to one side of the center of the castle, led to by a winding path lined with wild mint, sits another portion of the fortress which was locked. In the Ivane Javakhishvili Samtskhe-Javakheti History Museum. 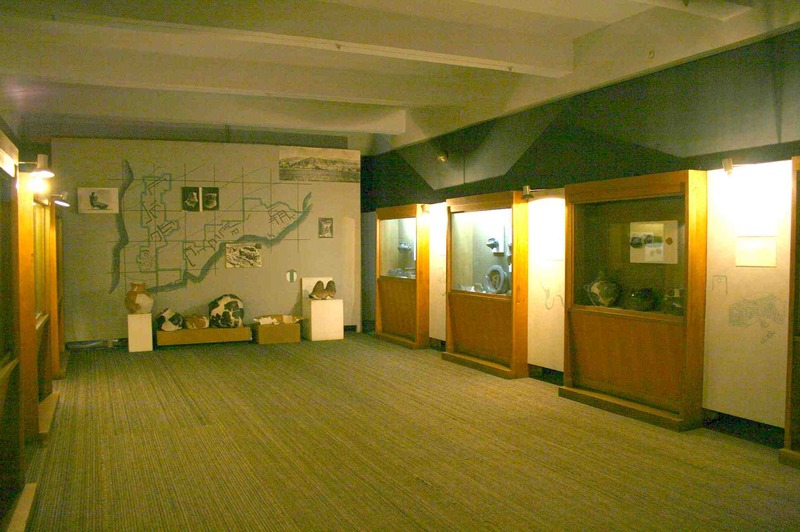 The museum itself, in an adjacent building, has a collection of ancient artifacts of variable interest; jewelry and pottery from the Bronze Age up to 19th century manuscripts, clothing, and weaponry. I asked about the 16th century manuscript of Rustaveli’s Knight in the Tiger Skin which my Lonely Planet guide says is here, but the guide, an elderly woman who looked rather annoyed to have been called out to open the museum for us (she generally stays in another building, and has to be summoned to open the doors), said she didn’t know anything about any such exhibit, and wouldn’t elaborate. Nothing, as far as I could see, from the period of Turkish occupation, however. After checking out the castle and the museum, we walked around the area, looking for other sites of interest mentioned in my guide book—the old Turkish baths, a synagogue, a Catholic church. 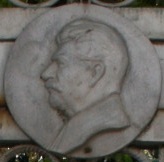 On the way we passed this gate of a house, and I was amused to see this medallion of stalin fixed to the middle of it. Stalin’s grandson is occasionally in the news, most recently because of his lawsuit against the newspaper Novaya Gazeta for supposedly “besmirching his family’s reputation” by calling his grandfather a “bloodthirsty cannibal.” I’m not sure if it’s the same guy, or simply a forgery, but an art gallery here in Tbilisi, on Erekle II near Shardeni claims to have a painting or two of Stalin’s grandson, both of which were pretty poor. As far as I know he lives in Georgia, probably somewhere in Tbilisi. An interesting subject to interview? The old Turkish baths near the castle. 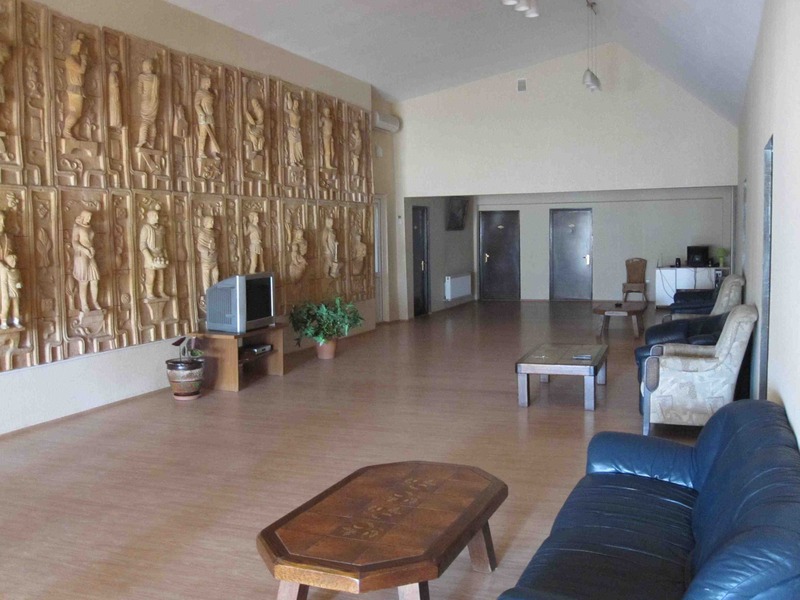 The old abano is a short walk from the castle, and sadly rather unimpressive. It’s decaying and appears as though parts of it have been cannibalized for building stone. It has obviously been a long time since it housed anything like a functioning bath; peeking through the loosely chained doors I saw that it was filled with firewood, serving as someone’s private firewood storage house. 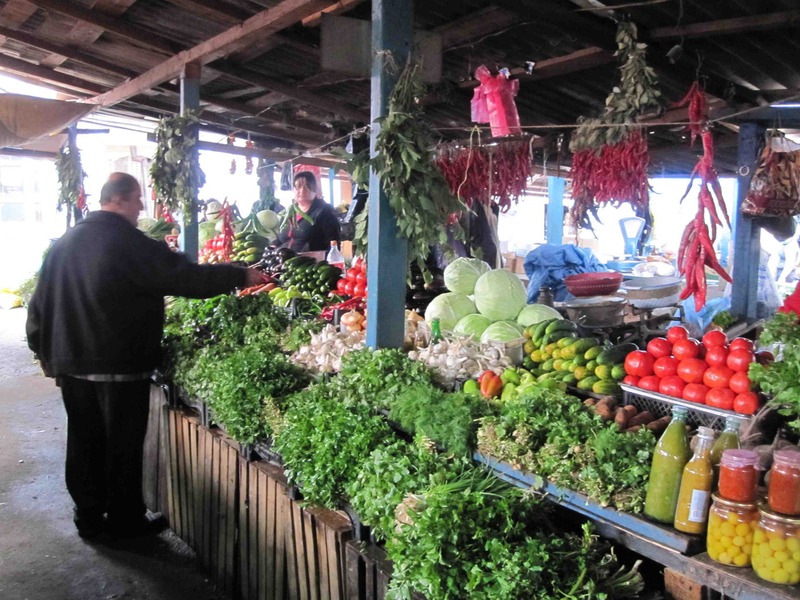 Just off Kostava is the bazaar, full of fresh produce, clothing of various shades of black from Turkey and a multiplicity of knick-knacks from China. We bought some delicious pickles which we ate as we wandered around. A pleasant place, really; it’s a couple of kilometers from the bus station on the way into town, on the other side of the river. New and clean, the rooms all leading off from this large central space. The staff are friendly and helpful, and there’s free wireless internet; the rooms are large and comfortable, and it’s quiet. The young-ish concierge, who had told us regretfully that the pool wasn’t available, drove us into town on a couple of occasions in a friendly sort of expiation. 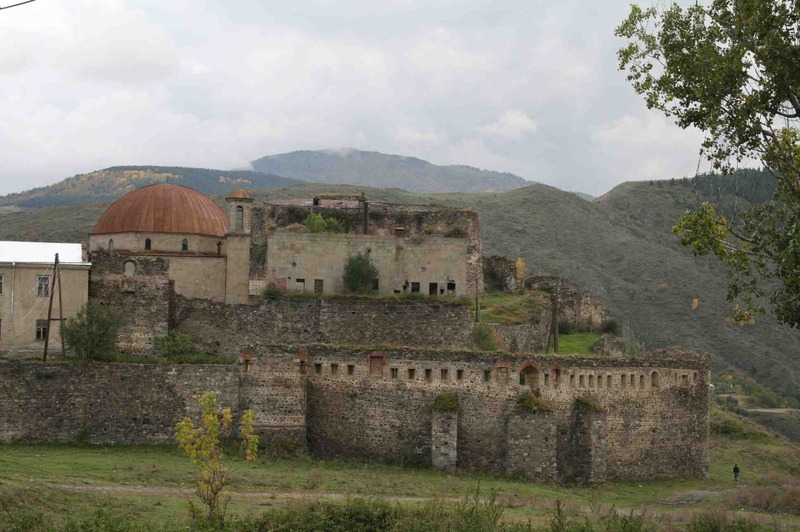 Ruins of a castle on the way from Akhaltsikhe to Borjomi. I think this picture was on the way from Akhaltsikhe to Borjomi, though the next day, Thursday, we went to Sapara and Vardzia. Question: I’m moving to Tbilisi from US. Would you recommend I learn basic Georgian or Russian, which I’ve been learning? Russian will be more useful if you’re traveling around the region—armenia, azerbaijan, etc—and just about everyone speaks Russian here in Georgia; but, also depending on how long you plan on staying, I think it’s well worth learning a bit of Georgian. It’s an interesting language and a few months’ study will go a long way! Thank you for that answer! I will mainly be in Tbilisi for awhile settling in with my family (children, too). Probably a year. Do most people in Tbilisi speak Russian, then? No matter what, I am going to learn a little Georgian because it is the home language and beautiful! But I was wondering if I should focus on Russian since it will be more practical in the long run. Yup, most people here speak Russian, with a slowly increasing number of the younger generation—in the urban areas, at least—speaking a little English. In the long run Russian may well indeed be more practical, though for things like street signs, store signs, and for public services like the metro system I’ve found the modicum of Georgian I’ve learned invaluable. Aside from people’s ability to speak Russian, you’re more likely to encounter English than Russian, both within Tbilisi and out in the provinces—menus, traffic signs, names of towns, rivers, and so on. But, upon recognizing you as a foreigner, many Georgians will naturally slip into Russian (but will be delighted when you answer in Georgian!). Best wishes for your stay in Georgia!